Welcome to A Writing Nook! We specialise in writing and illustrating children’s picture books as well as chapter books for older children. Our target audience are children from six to fifteen. We endeavour to write and illustrate stories that are happy, funny and blended with a bit of gross. Our stories focus on Australian animals, birds and critters. Some stories will combine African animals, birds and critters with their Australian multi legged cousins. It is important to us that adults enjoy our stories as much as the children do. We try to encourage quality time between parents and their children and there is no better way to interact than by sharing a funny story. Bin-A-Lake is the first of many children’s books. 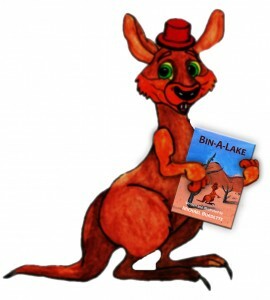 Bin-A-Lake tells the story of Is-A-Roo, a young kangaroo buck in the Australian outback who finds himself on an unexpected adventure. Bin-A-Lake will shortly be followed by Switch-A-Roo, a tale of African and Australian animals whose heads get swapped. Find out more about Bin-A-Lake, or discover the characters (such as Gordy the Goanna and Blowie the Fly) from Bin-A-Lake here. BIN-A-LAKE, the story of IS-A-ROO the kangaroo, is available now!